I hope that you all enjoyed your Thanksgiving holiday with your families and friends. I entertained quite a few myself and had a wonderful time visiting and sharing a fabulous Thanksgiving dinner. But now that the turkeys are in the attic and the leftovers are completely gone it's time to focus on the magic of Christmas and decorating the house a bit...... OK, a LOT. 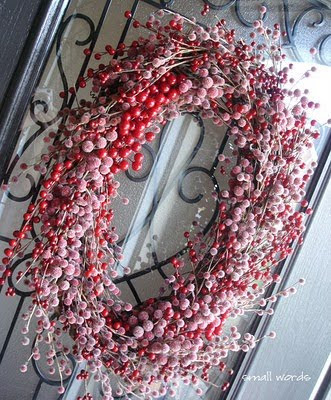 Over the weekend I found lots of great holiday door wreath ideas I thought I'd share on the blog today. 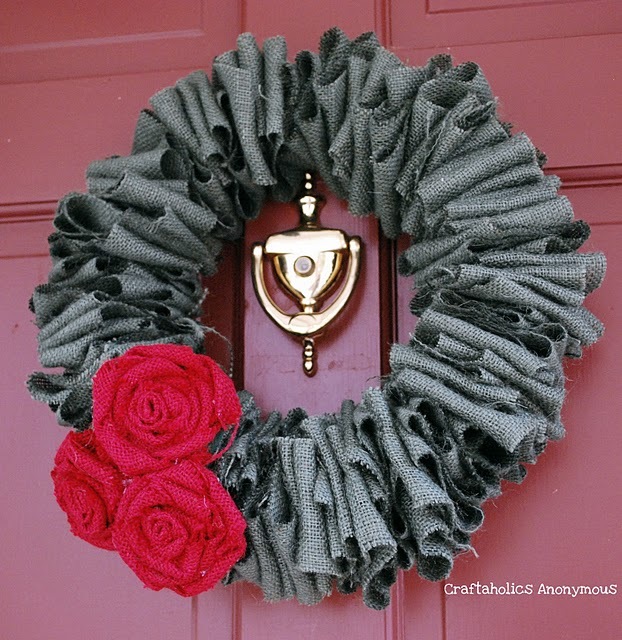 Most are simple craft projects and shouldn't break the bank, unless, of course, you have two front doors like me! It seemed like such a good idea when I was designing the house.... Now though, two wreaths for every holiday -- not such a good idea! 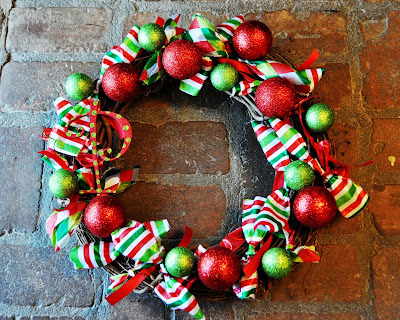 This stunning Ornament Wreath from Good Housekeeping is always a favorite. Start with a straw wreath form, cover it with pieces of white felt and then hot glue the ornaments on -- simple and it can be customized to coordinate with your own Christmas colors. Being a bit biased toward polka dots and ribbon myself, I'm loving this wreath from Stacy at She's Kinda Crafty. Stacy takes an 18" straw wreath form and lots of ribbon and performs a special kind of loopy magic to create this festive door wreath. 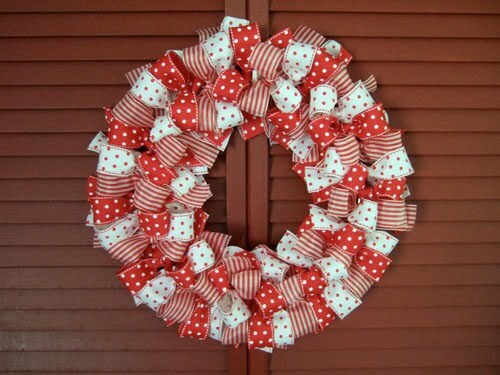 Another version of the ribbon wreath from Shelterness is a little smaller and possibly a little easier to make, too. Monica uses a 12" metal ring bought at the craft store and just ties 36 ribbons onto it. No-sew simple! Kim from Incredibly Cute Personalized Art has a great tutorial on this Berry Grapevine wreath using an oval shaped grapevine wreath as a base and then covering it with multiple pieces of holiday berry picks found at Hobby Lobby or Michaels. For all of you burlap lovers out there, here's one that sure to make you sing Fa La La La Lahh! The Holly Berry Burlap Wreath from Linda at Craftaholic's Anonymous is simply made with cut pieces of burlap folded and pierced onto a wire circular frame. 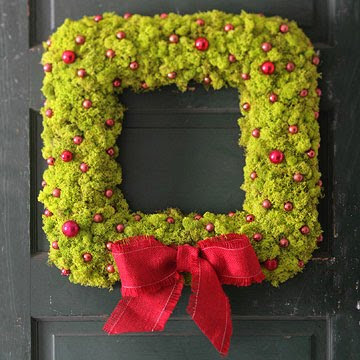 Better Homes and Gardens Moss Wreath is simply beautiful with it's light green reindeer moss and petite red ornaments. I love how they use simple materials and the square design to create a show stopper that will last for many years. Johnny in a Dress has a cute ribbon and glitter ball ornament wreath with a monogram initial, too. 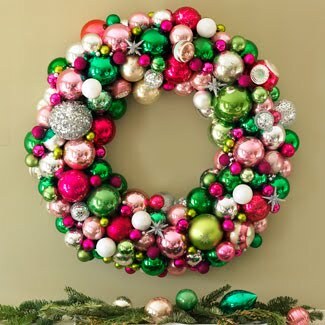 I found this unique wreath at DIY Home Decorating Ideas. 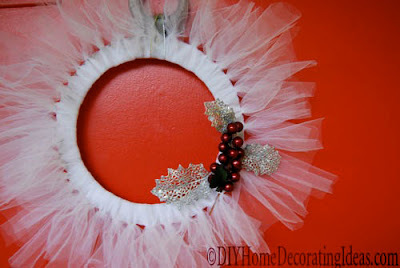 If you're looking for something a little different this year, this holiday wreath is very easy to make and it uses super inexpensive materials -- white tulle and cardboard! I think it would super sweet for a little girl's birthday or possibly a baby shower, too -- just switch the colors to some pink or blue. 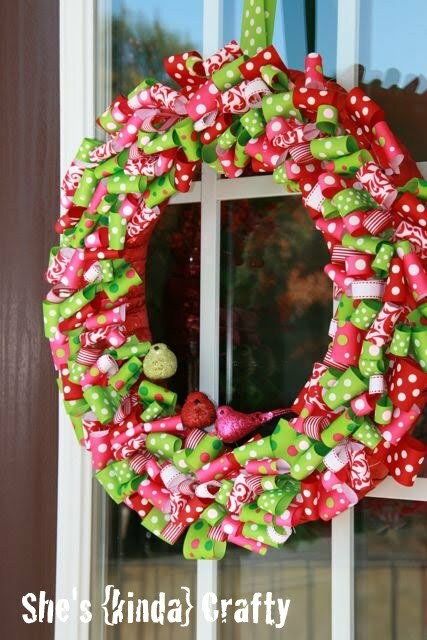 A few ornaments, a little ribbon and a whole lot of candy canes makes for an adorable holiday wreath idea. 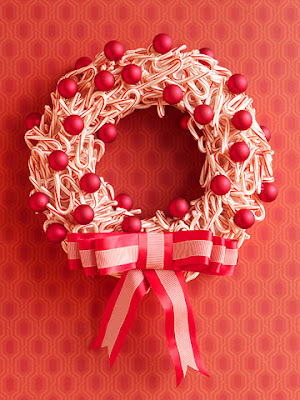 This Candy Cane Wreath from BHG is easy enough for the whole family to get involved in crafting. Looks like we've got some decisions to make and some crafting to do!! Best wishes getting the house decorated this week for all of you tackling that big project -- just think of how happy you'll be when it's all up and holiday fabulous!! 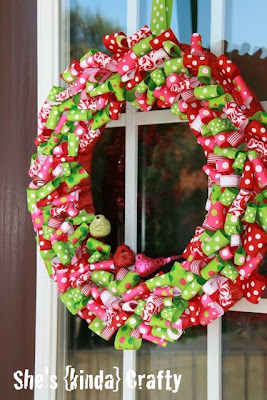 I bet we could make the ribbon wreath with fabric scraps. Thanks for the ideas.